Laboratory Glass Beaker are simply the containers which are used to keep chemicals for longer period. Laboratory Glass Beaker are made with glass and are available in different sizes. 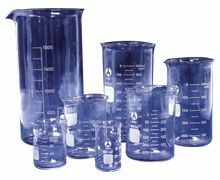 This Laboratory Glass Beaker is frequently used in a chemistry laboratory is special and in many other suitable applications. We are experienced manufacturer and supplier of Glass Beaker. We have wide range of Glass Beaker available.